Dessau, a town 80 miles southwest of Berlin, was home to the Bauhaus from 1925 until 1932. After being forced to relocate from its first home in Weimar, Walter Gropius took the opportunity to create a building for the school that was a physical embodiment of the institution's ideals. On of the most famous was the Bauhaus: 1919–1928 exhibition held at MoMA in New York, five year's after the school's closure in 1939. Displaying over 700 works from the school, the exhibition drew a huge amount of attention to the Bauhaus. 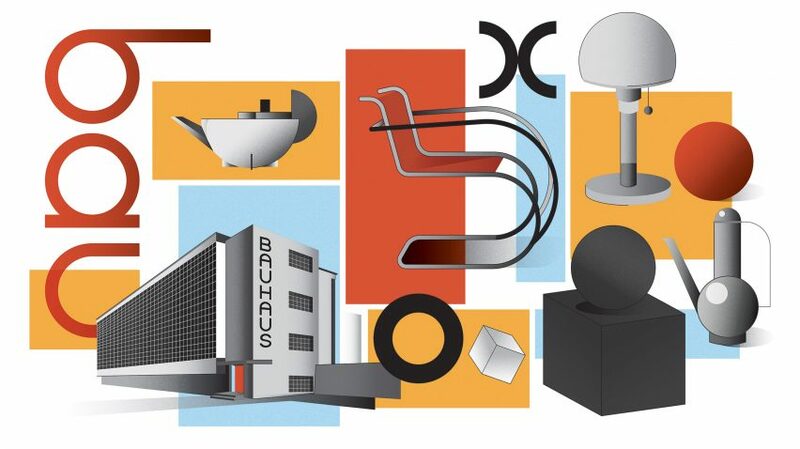 Designers at the Bauhaus created some of the most iconic pieces of furniture of the 20th century. Bauhaus furniture – from Breuer's Wassily Chair to Josef Hartwig's minimal chess set – was created to be functional above all other qualities. He wrote a manifesto setting out the principles of the school: "the Bauhaus strives to reunite arts and crafts – sculpture, painting, applied art, and handicrafts – as the permanent elements of a new architecture". Gropius left the Bauhaus in 1928 and worked in Germany, before fleeing to England and then moving to the USA in 1937, where he became a professor and director at Harvard University's Department of Architecture. Swiss painter Johannes Itten developed the original syllabus for the Bauhaus' preliminary course – focusing on material studies, colour theory and basic principles of design – and led its teaching with the school's establishment from 1919 until 1923. Hannes Meyer took over the Bauhaus as its second director after the departure of Walter Gropius in 1928, a role he would only spend two years with before being dismissed for political reasons. The Swiss architect only joined the school a year before becoming director, as head of the newly formed architecture department. Israeli architect and student of the Bauhaus, Arieh Sharon, was greatly influenced by him. In his short tenure, Meyer won several important architecture commissions for the school. Oskar Schlemmer was one of the Bauhaus' core educators, teaching at the school from 1920 to 1929. He first lead both the mural and sculpture departments at the school, before becoming director of the theatre workshop in 1923, where he established the experimental theatre workshop. In Schlemmer's most famous work, the Triadic Ballet created in 1922, actors perform as geometric representations of parts of the human body. The two giants of the Bauhaus – Walter Gropius and Ludwig Mies van der Rohe – are often quoted in regard to modernism and the ideals of the school. The first was the school's founder, and Mies was the school's final director. Gropius' manifesto (noted earlier) was written for the school's founding and contains its core ideals. Numerous other phrases are credited to him, including: "The ultimate goal of all visual artistic activity is construction" and "art itself cannot be taught, but craftsmanship can". The two phrases that Mies is best known for – "god is in the details" and "less is more" – were both said after the modernist architect left the school. One of the 20th century's greatest architects, Ludwig Mies van der Rohe – know widely as Mies – was the third and final director of the Bauhaus. Taking over the beleaguered design school from Hannes Meyer in 1930, he tried to remove politics from the school and shifted its direction almost entirely towards architecture. After the Dessau council closed the school in 1932, he rented a factory in Berlin as the school's home for its final moments. First led by Johannes Itten, then László Moholy-Nagy and finally Joseph Albers, the curriculum taught the Bauhaus' basic principles of design. Another of the Bauhaus' many couples, Michiko and Iwao Yamawaki joined the Bauhaus as students in 1930 having left Japan and spent a short time in New York. The Bauhaus school was started during Germany's Weimar Republic era, and in the city of Weimar itself, as a promise to a new democratic model and cultural renaissance, despite the country quickly dissolving for economic, political and social reasons.